A General Judgment was entered in the register of the court in the above-noted case on March 19, 2013. This judgment does not create a judgment lien. This notice is sent in accordance with ORS 18.078. The government doesn't mess around with pomp and circumstance and, you know, commonly accepted words of social understanding. So I called them on the old fashioned cellular telephone. me: "Does this letter mean that I'm divorced?" So that was a long and laborious process just to be un-married. I'm pretty sure lawyers are getting a kickback from the courthouse. The forms are incomprehensible, the process vaguely documented, the court-provided assistance available between the hours of 1 and 1:15 pm, every other Boxing Day and only if it's raining. It's no wonder there are so many divorce lawyers. It cost me 34 gallons of frustrated tears to get through this process, a price that I would have happily forked over to a a lawyer IF ONLY THEY ACCEPTED TEARS AS PAYMENT. But you know what, as the official robot spokesperson for the county courthouse confirmed over the phone with me the other day, I did it anyway. I am so divorced. I did it. Without a lawyer. Without paying anything except the filing fees. My ex and I are friends, which is incredibly helpful when splitting hairs and pulling teeth, but it's not like the other circumstances around our divorce was all color inside the lines and win a prize kind of simplicity. We have children together and will be splitting custody in halfsies. We have a house that, though it rots under the weight of its own bad investment strategy, is still in both our names. We have debt like most proud Americans do. It took multiple revisions, trips to the courthouse, patience, and 34 gallons of tears (which I may have already mentioned). But above all, it took support. We, the previously married, are not entirely represented, even though we are a statistic that dominates the US census bureau. And without representation, there isn't much by way of information resources. Google "how the hell do I get divorced?" and you'll get assaulted with ads for divorce in 3 simple steps (plus your wallet, your lunch money, and your first-born). Don't go there. Unless you have piles of lunch money and multiple first-borns, like Mrs. McCave. Where is Mr. McCave anyway? Pretty sure he bailed a long long time ago. But Mrs. McCave was overwhelmed by the paperwork, so she just stuck around. So here are my words of lessons learned, just in case you are 100% certain you want to go down the daunting path of disentanglement. If you're happily married, my blessings are upon thee. But if you know someone who could use some support, please share. If you're looking to be convinced that divorce is for you, don't look here. Go to counseling. Go for a run. You'll figure it out. Find support early. Can't find it? Make it. I created a private facebook group for other mamas in my community who had been through divorce, whether I knew them well or not. When I was frustrated with the process, or overwhelmed with missing my kids, or needed a good ol' fashioned virtual ALL CAPS YELLFEST, this is where I went. Other mamas added other mamas and so on. I asked questions and got answers. START WITH SUPPORT even if you think it doesn't exist. Understand the process. No one will make this easy on you. So make it as easy on yourself as possible. Paperwork packets are mostly available online now (at least in Oregon), but that doesn't mean that you'll be a) able to find the right link to the right packet, or b) will be confident that all the paperwork will be included, or c) that there will be easy step by step instructions. I would rather build an Ikea bunkbed blindfolded than fill out divorce paperwork. So I went to the courthouse directly. Paid them $5 for the co-petitioner paperwork. And asked them "what's next?" Understanding "what's next?" as opposed to the whole picture made it a much less jagged pill to swallow. And court clerks are content with answering one question. One. Question. Understand the words. I still don't understand why "Notice of Entry of Judgment" confirming that I am divorced doesn't say the word "divorce" anywhere in the letter. Nowhere. In fact, "divorce" is not mentioned anywhere in the entire paperwork packet. But where you don't understand the words, you can ask for clarity. Go to your support group. Call the automatons at the courthouse. Ask them your question of the day. Sound happy. Thank them profusely. You'll be calling them again. Bring back barter. This is the oldest way of getting/giving. Trading goods for services and vice versa. You have something someone wants. Put it out there. Ask for what you want in return. You might just get it. I found a Portland barter group on Facebook. I posted that I was looking for some assistance with filling out divorce paperwork, is anyone on here a paralegal by chance? And within minutes I got a reply. MINUTES. That very day I drove to her house and brought the goods that I had that I could trade for services. I emailed her all my divorce paperwork questions. She emailed me back the answers. (Thank you Tara!) People know stuff! YOU know stuff. People have stuff. YOU have stuff! See how this works? Don't be shy. Someone will very likely want your vintage rubber chicken collection. Talk about it. Remember, even though most marriages end in divorce, not that many folks are talking about it. But you can. And when you speak up, the others come out of the woodworks. And so we learn from each other. This is where social media has given us an advantage to evolve: by asking questions and sharing stories. Don't let it dominate your life. Frustrated by the process? Totally. You're going to want to punch the process in the face. And it effing deserves it! If you have a question or are stumped and you just want to cry, put the paperwork aside where you can't see it. Go cry. Then go talk about it. Come back later when you can breathe a bit easier and try it again. You may need to cry again, go talk about it again, and come back later again. And that's okay. Remember all the planning and frustration that went in to getting married? Same thing. Just reversies. Be patient with the process and go live. You'll get to check that divorce checkbox soon enough. 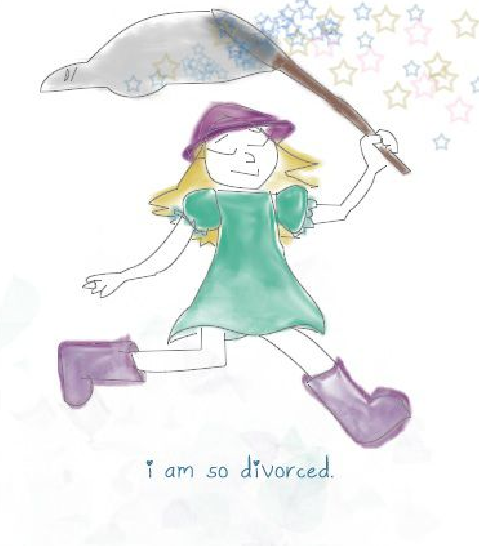 When that day comes and you can finally celebrate the end of the process, draw a picture of yourself prancing merrily in purple rainboots while catching stars in a butterfly net. Embrace your badass self and know that your identity is not whether you're married, divorced or somewhere in between. You're not the first to go through this. And neither was I. Today i made people angry. Hallelujah. Get trussed. A thank you to Rugged Grace.